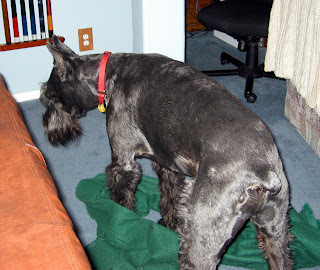 The Incomparable Boogie™, enjoying a game with his blankie after dinner. He has a nob on the front (pointy skull) and a nob on the back (tail). Anne, I think so, too. Nice picture of Boogie. We just said goodbye to Nora today, 3 months after her 11th birthday. It was comforting, not saddening, to see a picture of another Giant goofball. NORASDAD, I'm very sorry to here that Nora is no longer with us.